The last “base play” in our arsenal, and the final in post in my “cut up of the day” series is the cross concept. It has got to be the most popular bootleg concept in football. It is essentially the same as our Flood play but from a 2×2 alignment. 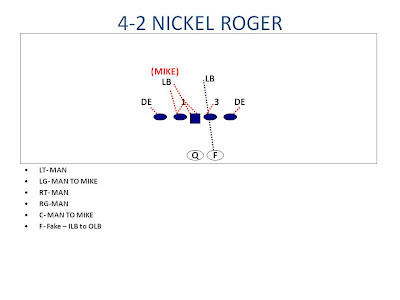 This concept is run at every level of football and from any sort of personnel group. 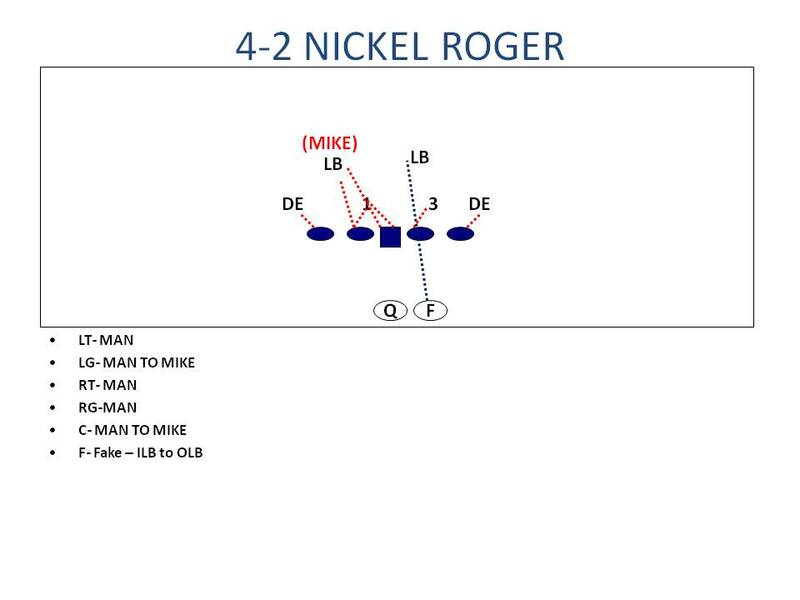 We hit the out very often as the OLB covering him was often out leveraged due to his alignment and initial run read. 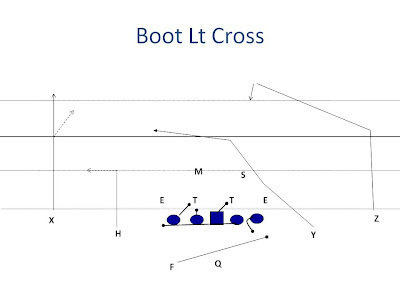 We were also able to hit the cross a few times when the OLB jumped the out, and ILBs sucked up on the play action, leaving a void. 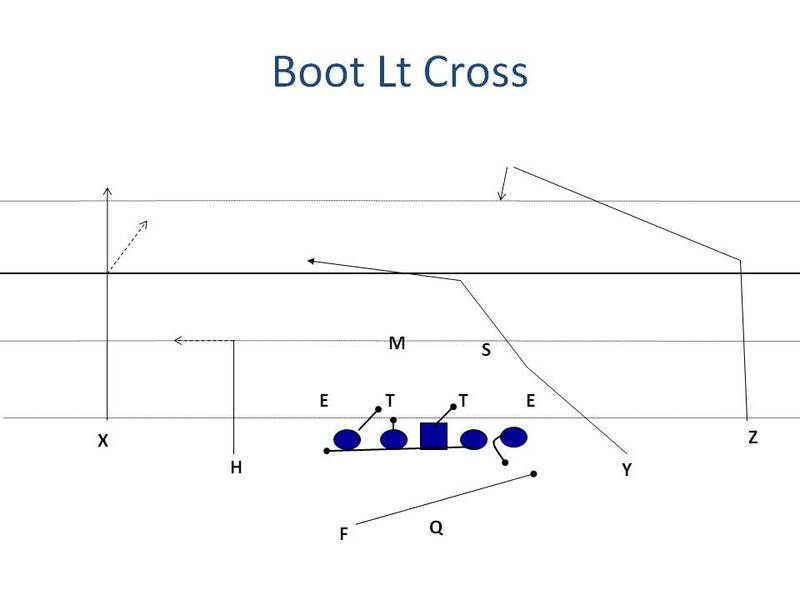 Even against man the cross is a great concept because it is difficult to cover a speedy slot WR across the width of the field. 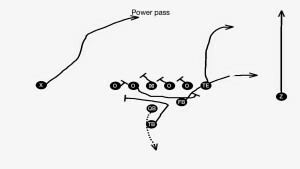 I thought this concept worked exceptionally well for us because the guard pull added to the run action and in one game particular (where they had a DE who we simply could not block) this played slowed him up a whole lot. He could no longer crash down when he read down block and blow up our guard. Some of the clips feature a QB who began the year as our 3rd stringer! Starter got suspended a game, and he beat out the kid who was our backup all year during that week of practice. The clips with #12 at QB were his first start at QB of his life. 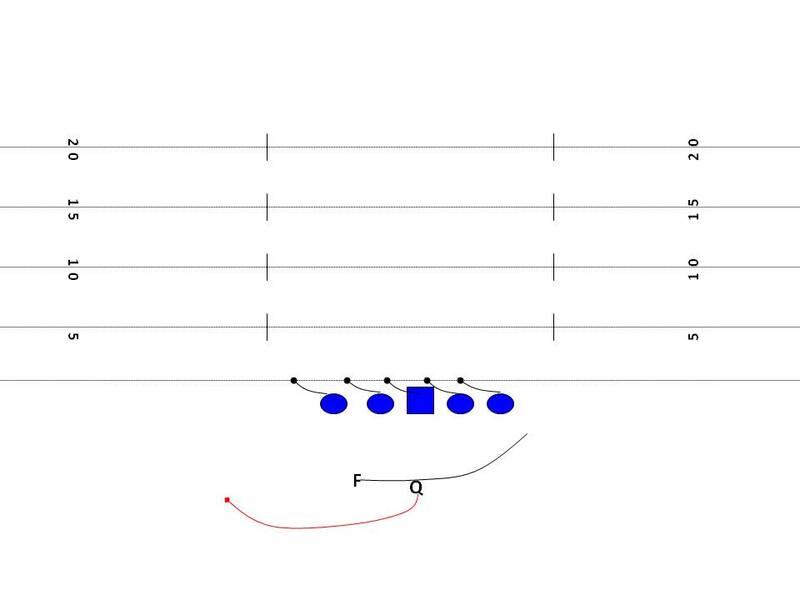 I didn’t include it in the film but he even picked up a huge 4th and 4 conversion on this play with his feet when the defense didn’t bite on the run fake and flew out for pass. I see this concept being a bigger part of our offense in the future as we begin to explore the use of some TE/H back stuff. 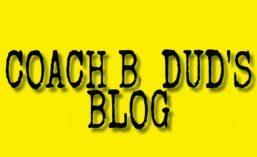 Posted in HS Film, Offense, Pass Game, Play Action Game, Spread. 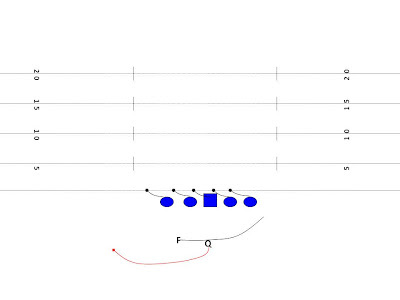 I have recently received some private emails asking to discuss play action and goal line passes in the spread, so I decided to offer up my favorite play action pass concept. 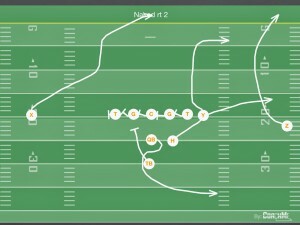 I first began running this simple PA concept in a splitback fly/pro style offense. Our bread and butter was criss cross counter trey and this was our play action off of that look. We had a ton of success with it, and I wanted to get the same look out of our spread stuff at my new school. I realized that I could easily do the exact same things out of a 2×2 set as I could out of our splitback set. From splitbacks we would criss cross the backs, one slipped into the flat, TE ran a deep drag, SE ran a Go (basically just to clear out) and flanker ran a backside post. 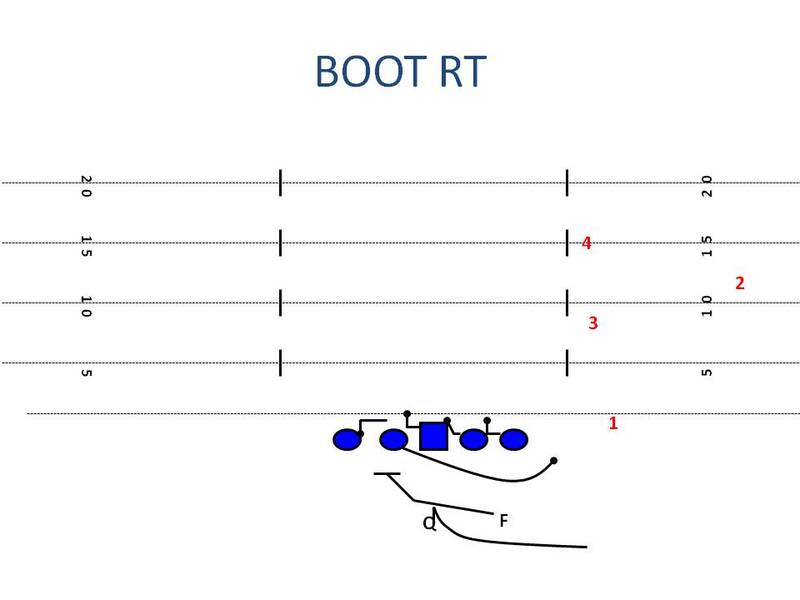 These routes are easily converted into our spread stuff, we have merely moved the 2nd RB into the left slot position (H). When we ran this under center every single time either the RB was wide open in the flat or the Y was wide open… It was a great play for us. I installed it last season with my JV team but didn’t get around to running it much. Finally called it on a big 3rd down play, and got everything I wanted, deep coverage went deep with the X. Flat defender jumped the out, so we would have had Y WIDE open on the cross… but he ran straight into one of the officials, fell down and never got back up. I should have worked on it more so I would have called it more. 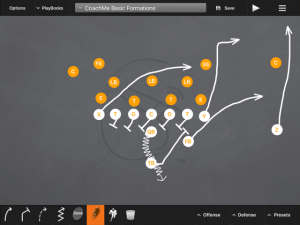 Posted in Offense, Play Action Game.